Size: 15 mm dia. to 3000 mm dia. We are offering Fume Exhaust FRP Duct to our clients. Finding use in different sectors, these FRP Ducts offered by us are corrosion resistant, long lasting, light weight as well as leak proof, thus making these easy as well as low maintenance choices. These fiberglass reinforced plastic (FRP) ducts find use in different types of installations like aquatic, industrial, commercial. Engaged in manufacturing and supplying of FRP Ducts. Our well-equipped factories have excellent facilities for manufacturing our products. 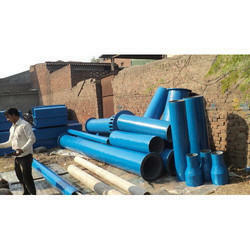 We are fabricating wide range of FRP Ducting System to our valuable customers. Made using optimum quality materials and metals, these products are assured for their seamless design and optimum quality. We specialize in manufacturing and supplying an exquisite range of FRP Rectangular Ducting. These products are manufactured keeping in mind the requirement of the customers. These products are highly applauded by customers for their outstanding performance and sturdy construction.